If Jesus walked by me while I was sitting at my desk writing liturgy for an upcoming worship service and said to me, “Let’s go.” I think I may have said, “What? Are you kidding me?” I think it’s entirely true and probably a bit hard for you and I to admit – that – most of us admire what the first disciples do in fact do, but few, if any of us, are actually willing to do the same. One thing is for sure when reading the gospel of Mark. You better buckle your seat belts and hang on for the ride. Mark wastes no time getting to the point of this Jesus and what his mission and ministry is all about. Mark is not like Matthew’s gospel with a beautiful birth story complete with detailed genealogy and wise men and adventures to Egypt. Mark is not like Luke’s gospel where we encounter the drama of Jesus’ dedication at the Temple and a party at Aunt Elizabeth’s house and a bit of political intrigue with King Herod. Mark is not like John’s gospel, an eloquent poetic and theological journey of God becoming flesh through this one Jesus and literally moving in. Mark doesn’t waste any time. Mark wants those who hear these words to know that the time is now. Ready or not, here we go. Put down your nets – it’s time! Let’s go! With the arrival of Jesus, the world has changed forever and will never be the same again. One of Mark’s favorite words throughout his gospel is the word – “immediately.” It’s a word that Mark uses over and over in his gospel. What’s the hurry Mark? Why the urgency? Methodist Pastor Ted Smith said that “Mark begins like an alarm clock, persistently declaring the time and demanding some response.” The response of the first disciples is to leave everything behind and follow. Go. Now! But Barbara Brown Taylor suggests that we are missing the point of this story if our focus is on what the disciples gave up and whether we are in fact able to do the same today. In her sermon “Miracle on the Beach” Taylor claims that this story is really about God, not the disciples or us. I don’t think Jesus was asking the first disciples to just add something to the list of things they already had to do. Jesus doesn’t give them a new list. Instead he’s offers them a new identity. A new way of doing. A new way of being. I’m not afraid to tell others that I love the church. I am passionate about being part of a church that is deeply and intimately connected to strange folks like Peter, Andrew, James, and John. These men weren’t people of extraordinary talent or wealth, yet Jesus saw them as they were, doing what they did as ordinary people trying to make a living and care for their families and the community in which they lived. Jesus called out to them and asked them to follow. I’m also not afraid to tell others that I don’t believe everything about the church is perfect either, just look at us. You and I have nets just like Peter, Andrew, James, and John. And most of us have far more than fish caught in our nets. That’s what makes it so very hard for us to let go of them and follow this Jesus. I think that may be the reason why the gospel writer of Mark seems to be in such a hurry with his abundant use of the word “immediately” in his story of Jesus. He’s afraid that we’ve either become so concerned with looking at what someone else has in their nets or that we’ve become so complacent with what the power of God is doing in our lives that we really don’t care anymore. In Jesus, the disciples saw God and for whatever reason believed that nothing would ever be the same again. 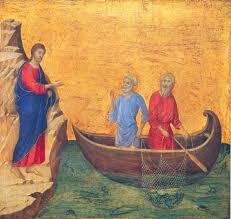 Stay with their nets or go with Jesus – it really didn’t matter anymore which choice they made – God had come to them. Nets and all. Brothers and sisters in Christ, the time is fulfilled, and the kingdom of God has come near. It’s time to put down our nets and follow. Amen. This entry was posted on Monday, January 23rd, 2012 at 1:19 am	and posted in Recent Sermons. You can follow any responses to this entry through the RSS 2.0 feed.